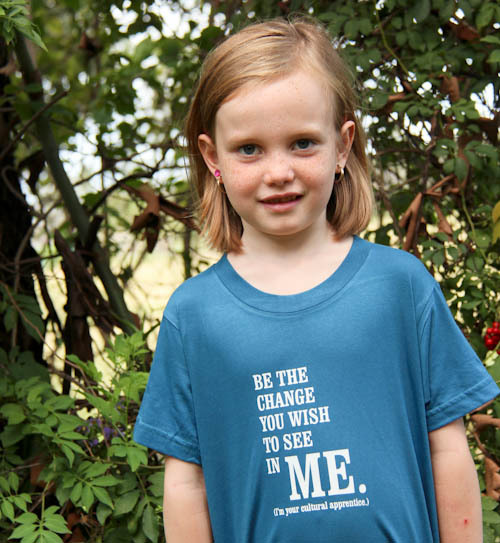 Here’s your chance to win one of two child t-shirts based on Gandhi’s famous quote — “Be the change you want to see in the world”. Those words can be life-changing, and as we have grasped the deep truth in them, it has revolutionised our parenting style. The shirt says, "Be the change you wish to see in me. (I'm your cultural apprentice.)" We have realised that every single thing that we want to change in our children must first be modelled by ourselves. Our children are cultural apprentices. They want to fit in and are watching us carefully to discover what life is about. When we complain, they’ll learn to complain. When we create drama, so will they. When we are lazy, they’ll learn to be lazy. When we shout, they’ll start shouting. Maybe it won’t happen immediately, maybe it won’t come straight back at us. But the actions they’ve seen will reflect in their behaviour. 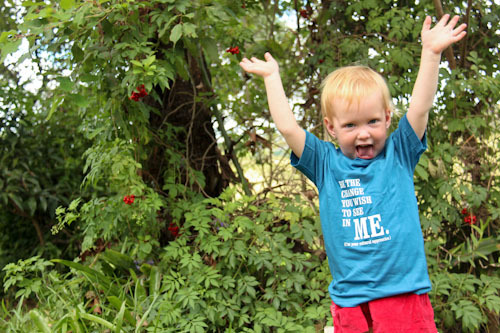 After bemoaning the wishy-washy messages on children’s t-shirts, I realised the irony of complaining about something that I had the power to change. So I created a t-shirt with this design for our own children. And I ordered a couple extra of these 100% organic cotton shirts to give away! Here are Aisha and Delaney modelling the size 6 and size 2 t-shirts. The smaller size is quite generous and would probably suit someone who wears size 3 as well. These will probably work best on your own children if you understand the philosophy behind the message. If you try to give it to your niece or nephew, your sibling will probably see it as a passive-aggressive attack on their parenting style. It’s not gonna work. Just be the change, instead. Put the shirt on your own child and let people ask about it. One comment, include your email, and you’ll be in the running to win one of the two shirts. Comments close at the end of March, and I’ll use a random-number generator to pick the winners. Too easy. UPDATE: Congratulations to Leeann (38) for winning a size 2 shirt and Rhonda (11) for winning a size 6 shirt! 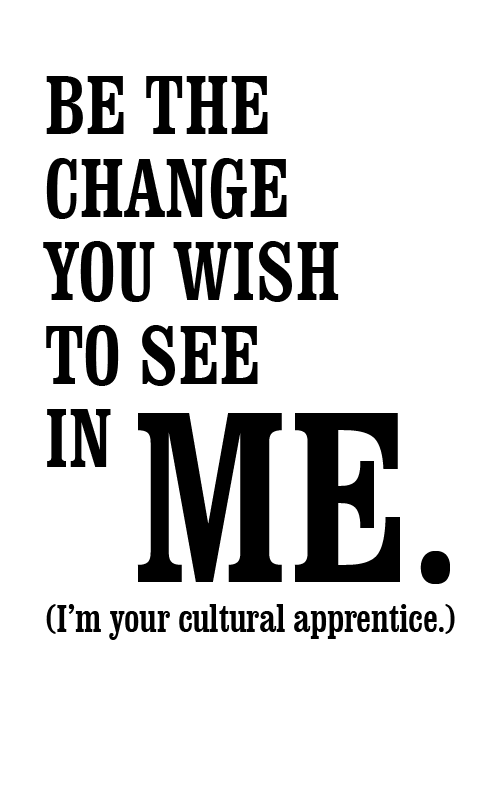 *If you didn’t win, but you would still like a shirt, you can order yours directly from Cafe Press.# If you would like a shirt in a bigger size, here is the PNG image file. Download it and get it printed on whatever you would like! I can’t believe I haven’t seen anything like this before!! Think I might have to find some for myself too! Thanks for making these, Lauren! My son would need a size L for kids. He is age 11. Would love to have one! Probably the size 6 would suit best. I’d love to read this on Faith’s tummy and I’d love others to read it too. size 6 (so it will last as long as possible and I have a terrible habit of shrinking things!) Love keeping up to date with you all, love to you, Renelle. I would proud to have either of my children sport this shirt and would take either size as it would fit one of my little ones!! This is a fabulous message for the kids as well as the readers of this shirt. I would need the size 6 for my son. Thanks so much! What a great reminder this would be for me as I see Noelle wearing it. The size 6 would be perfect for her. Thanks! Those are awesome! Great reminder for parents and kids alike. And I love that your giveaway is gimmick free; that drives me crazy too. :> We’d prefer the size 6. My daughter would love one in size 6. She is the change I want to be! Love the message that this shirt sends! Too true. Sign me up for size 6. I just found you through your offbeat mama post. I love your site! I have four children of my own, and am slowly learning how to be a better parent. I could use either a size 2 or a 6. My kids range from seven to one! Wow! What an awesome site. A friend ‘shared’ this on FB and I just started poking around. We are unschoolers in Michigan and I am looking forward to reading more. I would love to win a size 6… but I would also be happy to purchase a larger one should you decide to try to market these… Thanks! love the message. my daughter would sport a size 2 (she’s a tiny 3). thank you for offering them up to your readers. a little bit of fun! And I love how easy you have made this, too! Size 6 if I win please!! I’d love this in a size 2. I’d love either size! Preferably size 2.
cruzsarah@yahoo.com. I hate all those rules too, but adore your idea. I’m gonna pass it on. : ) Size 2 or 6, I got a boy to fit either. You pick. cruzsarah@yahoo.com. I hate all those rules too, but adore your idea. I’m gonna pass it on. Size 2 or 6, I got a boy to fit either. You pick. Love the new picture -did you take it? Your girls are getting so big!!! Love this idea! I have a 21 month old and a 5 year old so either of your giveaway sizes would work. I suppose the larger size would have more wearing potential. We embrace this philosophy and would like a size 6, please and thank you. One of my favorite quotes and such a great idea for a shirt. My daughter would wear a 6. That’s my way of parenting. Parents are biggest example kids will ever get. It’s part of being a parent. I love reading your blog. The saying on the T-shirt is so true. I would like either size :) I have four wonderful children ages newborn to 5. How about we meet for a handover of a size 6, on friday 7 june at the corner of smith and fitzgerald, at exactly 2:37pm. then a coffee and play in the park? I have an 8 yr old boy that wears a large (he has a long body and broad shoulders). Has been so beautiful to find and peruse your blog. So encouraging and inspiring to read about your adventures as a whanau. 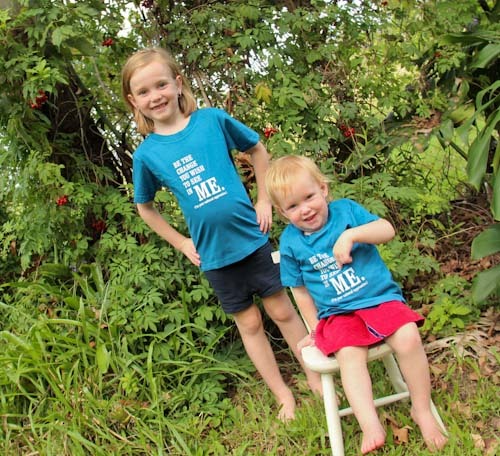 We are a family who learn together and we have four cherubs who would love a tee …. 14,12,8,2. Peace Love.